After damaging in intercostel in my last fight, I was forced to take some rest. It’s true – it was my bodies way of telling me to rest. I was so disappointed though, knowing that Caley Reece was coming back for a month and I was fearing I would miss the opportunity to train with her. After some time off, and a lot of impatience on my part, I began to start doing what I could to get my fitness back and was able to begin boxing. 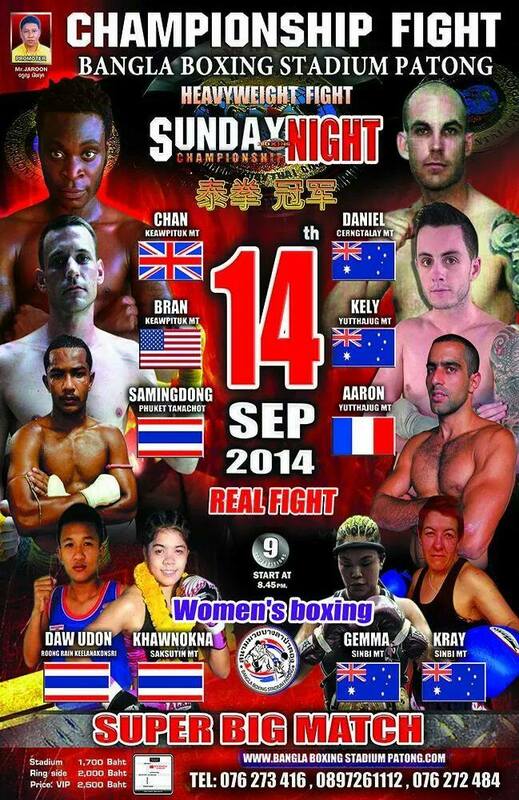 After a week of boxing and a further week of Muay Thai, I was scheduled to fight on the 3rd of September. My fight then got pushed to the 5th, and then finally again to the 14th. 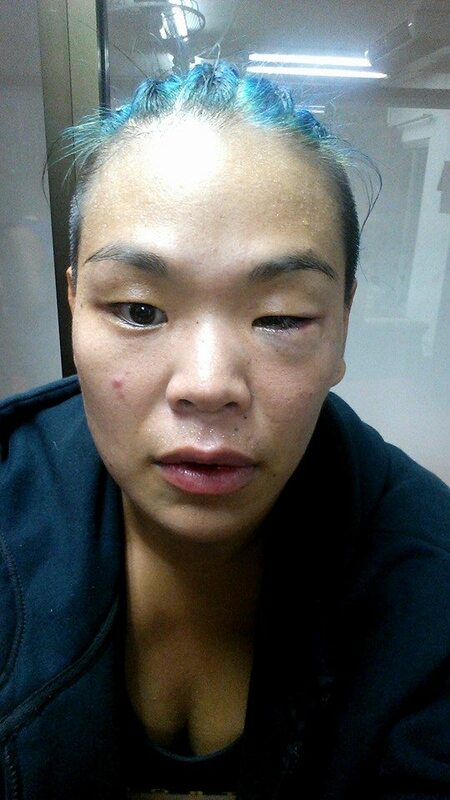 Originally I was to fight an unknown opponent but as circumstances changed, I was scheduled to re match Dao Udon, the girl I fought 6 weeks prior and had injured myself against. The time off was good for me. It allowed me to get some much needed rest and let me brain catch up to what I was putting my body through. When I finally came back to spar, I found that I had improved significantly, much like after my break earlier on in the year. Things just clicked, everything was beginning to make sense, and I had the two greatest training partners in the world, Caley and Teresa to keep pushing me and helping me grow. The battle itself was more mental for me. I knew this girl was looking for revenge and my confidence in the clinch, where I beat her last time, (and subsequently injured myself) was low. To top things off, because my fight had been pushed back so far, my trainer had to go home for a week to visit his family and I was without a trainer for the most important part of my fight preparation. 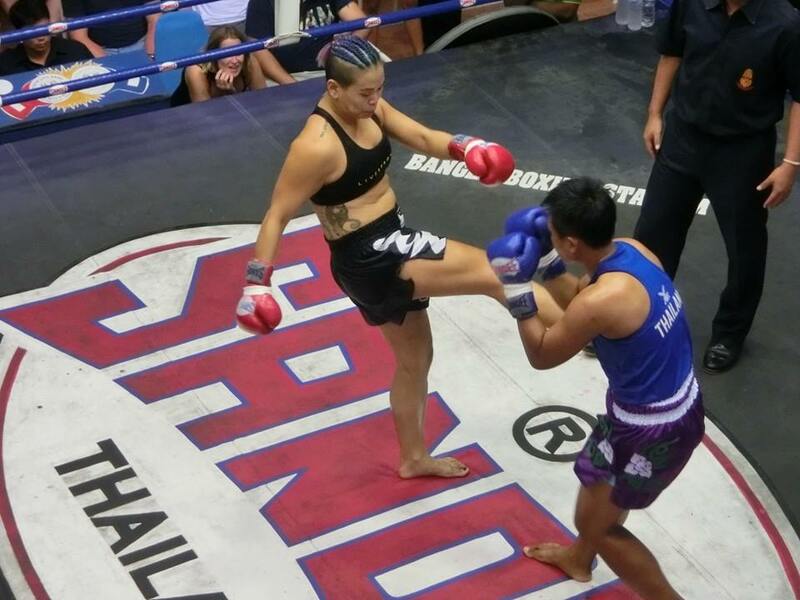 The great thing about Sinbi Muay Thai, is that there isn’t really a bad trainer in the gym. All of our trainers are highly experienced and incredible trainers. For me personally though, I missed the rhythm of being with my own trainer. Having a new trainer every session meant that I had to adjust each session to a new pad holder. It also meant I wasn’t getting as much out of my pads sessions as I could have been. When I had finally found a trainer who would push me hard enough, and ask him to train me for my fight, my trainer had come home. Because of my injury and the change of dates to my fight, this is possibly the longest training camp I have done thus far. It’s safe to say that on my final day of training, I was so exhausted I could barely kick pads and I was tired going into my fight. Preparation was difficult. I was still unable to clinch much as I was trying to avoid further injuring myself, but it did allow me to spar with Caley most days. This is where I felt the most improvement. I’m not going to lie. Nerves found me this fight. I was not eager to rematch someone who had had 15x more fights than me, but at the end of the day I have always said that I wanted to be challenged. When fight day came around, I was exhausted. Probably more so than I have been before a fight thus far. I had some concerns that my fitness was not at my peak but believed that I could beat this girl again. The instructions after the second round were pretty simple. Move forward and clinch. Unfortunately, he front kick (and my slow slow brain) kept me from forcing a clinch and every time I moved forward she was kicking me and I was finding it impossible to check her kicks. I realise this is a skill that I need to develop, but unfortunately I am not quite there yet. A take down in the middle of the third round inspired me with a little confidence but I was getting frustrated and I was getting hurt. The last time I fought Dao Udon, she was fast, and she was strong – but she wasn’t this fast, and she definitely wasn’t this strong. When I reply the video to myself, I can hear the sounds of her kicks. It’s given me something to really work on. Round 4 I knew I really needed to get into the clinch if I stood a chance at swinging the score cards back in my favour. I don’t know what went wrong, but it was like my first fight, where everything I knew to do went out the window. Dao Udon was prepared for me this time. I beat her in the clinch last time and she wasn’t willing to risk it. 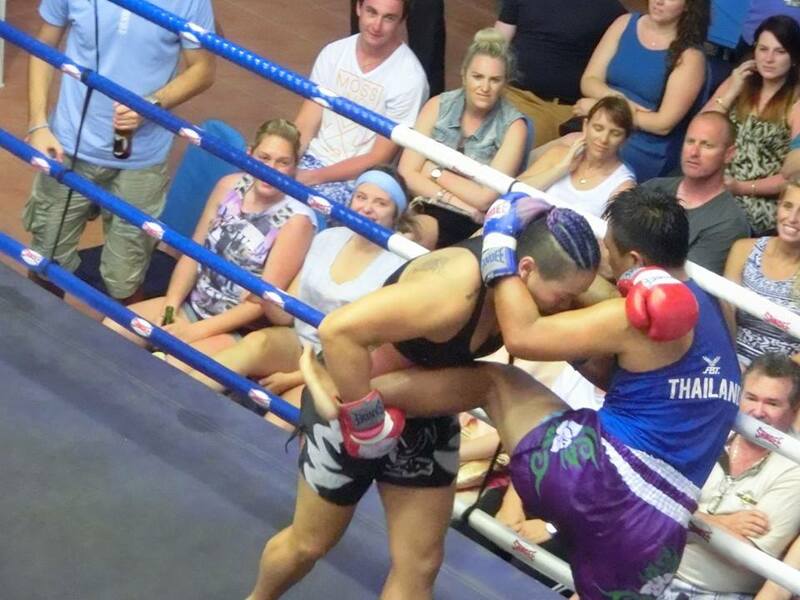 She knew how to stop me in the clinch, awarding the points to her, despite the work I may have done in the clinch. She had me back in a corner twice, but for some reason didn’t try to end me. All I can think to myself is “why didn’t you step in with an up elbow!?!? !” Again, easier said than done. A happy little hip throw in the 4th gave me a glimmer of hope, but I knew I was losing. 5th round was all in – get into the clinch an knee. Every time I stepped forward, she was hitting me, or kicking me. It was so frustrating that my brain couldn’t think fast enough to do what my body knows to do. My eye was almost swollen shut by this stage and I was throwing in desperation. I walk in for the clinch and she knocks my mouth guard lose with a punch as I am coming in for the clinch. My front teeth connect with her forehead (completely by accident) and a searing pain shoots into my mouth. I continue moving forward, feeling more and more frustrated, and more and more helpless, and in an instant, it’s over. It’s the first professional fight I’ve had where I a) instantly knew I had lost, b) it all felt like a messy blur and c) was so happy to hear the sweet sweet sounds of that final bell. I remember climbing out of the ring and grabbing Teresa. The only thing I can say to her is “please – can you take out my mouth guard – I think my front two teeth have been knocked out”. She did amazingly well to hide her terror from me and my good friend Kelly came over, calm as a cucumber, and slowly removed my mouth guard. Sure enough, my whole mouth just began to seep with blood from my gums and my gums were so swollen that they were pushing my top lip so high, it was almost touching my nose. A quick check to the doctor in my slightly shocked and slightly concussed state confirmed that my teeth were a little loose but ok. Nothing some Thai smelling herbs can’t fix! 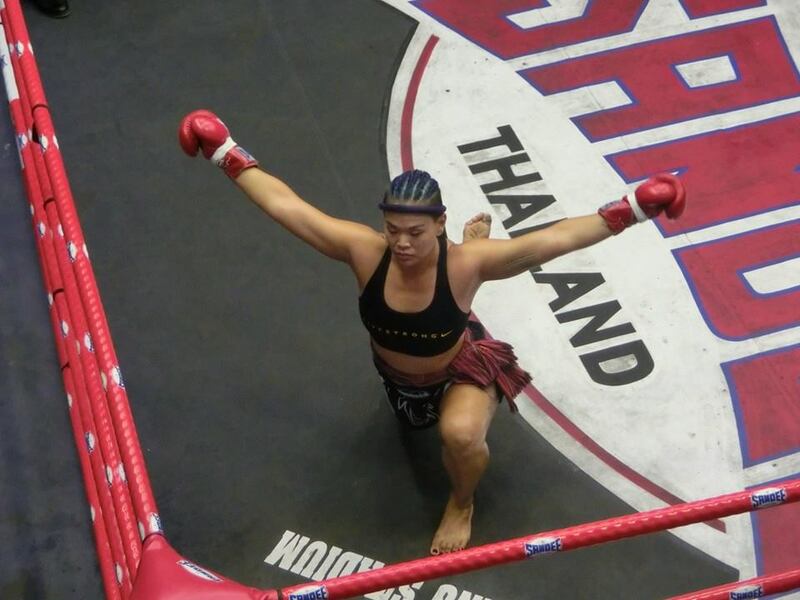 Dao Udon was very graceful and respectful in her victory – she is an incredibly well rounder, strong fighter and this fight has given me so much to work towards. It was a fight that I believe will move me up into the next level. I know what I can handle, and I know what I need to work on now. I can’t wait to get back into the ring. As always, there is not enough gratitude in the world for me to express my thanks to my incredible sponsors – Kombat Cafe, Pure Energy, Elite Combat Nutrition, Absolute MMA, DHF Woden and Manage My Media. Your continuous support is overwhelming and I am so grateful to you all for your contributions to my journey. And especially, a massive thank to you my trainer Nai – who always looks after me and pushes me to do my best. I’m sorry I didn’t take the win this time, but I’ll be back for more! !